If financial technology (better known as fintech) companies have the power to transform the international finance industry, just imagine what it could do for economic transformation in South Africa! The good news is that this international trend has reached South African shores and fintech investment start-ups are popping up all over the place like mushrooms—in many cases by black professionals with extensive experience in the finance industry. The need to support and underpin these companies has increased over the past five years and fintech owners are saying that people in South Africa have finally come to realise how their industry can close gaps that will boost transformation among the poor and the country’s thousands of struggling SMMEs. In recognition of the work done by fintech investment start-ups, five of South Africa's top BEE fintech start-ups were recently awarded R1 million each—Merrill Lynch South Africa (donated R4 million) and Royal Bafokeng (donated R1 million)—at a high-speed pitching event at AlphaCode, the Rand Merchant Investments club for fintech entrepreneurs. 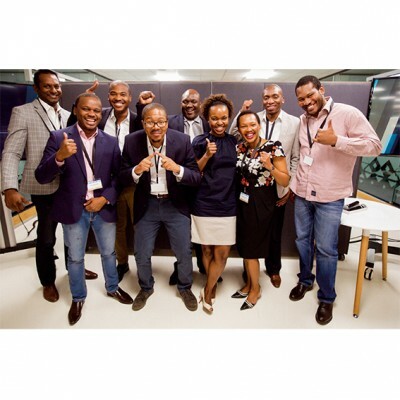 The Broad-based Black Economic Empowerment (B-BBEE) pitching event is an initiative of Merrill Lynch South Africa and AlphaCode and seeks to identify and reward high potential South African fintech entrepreneurs to catalyse the development of fintech in South Africa. The event was run for the second time this year in collaboration with AlphaCode, a collaborative hub for next generation financial services entrepreneurs that aims to provide a platform for members to engage and work alongside experienced entrepreneurs, technology investors and industry experts, resulting in accelerated growth and access to market. Winning the big bucks aside, the five winning companies will become AlphaCode platinum members, which entitles them to office space and one year of incubation. E-factor (Founder: Tito Mbatha), an online marketplace that allows small and medium sized businesses to sell their invoices so that they can obtain payment within 24 hours. Imafin (Founder: Nivan Bilou), established in 2013, is a specialist payment and commercial credit firm driven by innovation on traditional payments models. Invoiceworx (Founders: Siya Ntutela and Mdu Thabete) is an online platform that enables SMEs to save time and money when applying for credit from financial institutions. Stokfella (Founders: Tshepo Moloi and Ruddy Mukwamu) is an innovative digital platform for stokvels to manage their day-to-day affairs with ease. During the event, eleven contestants had just five minutes to pitch their businesses with a couple of minutes set aside for questions. Judges included Dominique Collett (Senior Investment Executive at Rand Merchant Investments), Richard Gush (CEO of Merrill Lynch South Africa) Albertina Kekana (CEO of Royal Bafokeng Holdings) and Sonja Sebotsa (principle partner at Identity Partners). According to Gush South Africa has the potential to become a fintech centre of excellence as it has an incredibly advanced financial services infrastructure. AlphaCode was established a year ago to drive and support innovation in financial services and to fast-track financial inclusion in our society. The partnership with Merrill Lynch South Africa allows the mainstream financial services sector to help support emerging fintech innovators. Highlighting the need for support for fintech companies in South Africa, AlphaCode has, over the course of its first year, aside from clocking up over 1 000 members, seen eight member-to-member deals and eight deals facilitated with RMI portfolio companies. Collett said the top tier members are building innovative fintech solutions that cut across the spectrum of financial service disciplines—from lending, payments and financial literacy to blockchain, robo-advising and data analytics. Many operate as successful financial technology businesses, while others are using the networking, sharing and mentoring offered at AlphaCode to launch. “The Rand Merchant Group has a history of partnering extraordinary entrepreneurs who have built disruptive, successful businesses such as RMB, Discovery and OUTsurance. To accelerate the kind of financial innovation that we envisaged we knew we needed two things. AlphaCode members include Bankymoon, which has started consulting for the South African Reserve Bank on blockchain technology, iKhokha, which has partnered Mastercard to roll out 700 innovative new point of sale devices, and Peach Payments, which provides payment solutions to online and mobile businesses. “AlphaCode aims to be the epicentre of the fintech ecosystem in South Africa and Africa and we are keen to learn from other emerging markets,” said Collett.